Everyone enjoyed party and vacations with their friends, collages, relatives and group. Whether it is wedding ceremony, picnic or official event you will have pictures to memorize events and fun time. Just think how you will memorize these events forever. Of course, you will keep memories or photographs with you on iPad, but question arises that how much photos you can keep along with you? Apart from this how you will sort them in order to keep fresh your memory? Photo management is the best way to keep memorize along with you always as you will be able to arrange photographs in a specific orders. When we talk about photo management on iPad, then we will require application. “Photos to Albums” is an application which allows users to manage pictures and create albums on iPad. User can create different albums or folders based on GPS location data, date, tags, rating and EXIF data. Tags to create albums can be read from popular software such as adobe Photoshop, Adobe Bridge, light room, apple iPhoto and Microsoft photo app. • You can add cliparts and shapes to different albums. • You can add text layers to spice up your albums with caption. • This app allows to export high resolution PDF files for albums. • Users can add border or frames to photos so that different look can be given to different albums. • App allows to lock individual elements or whole page for the security concern. • Control shadow, opacity and colors for various elements in albums. • Photos can be filtered based on tags, EXIF, Meta tags, rating, size, date range, etc. • User can sort photos via applying multiple parameters at once. • Photos can be shown on map with location data. • Slideshow with music so you can play music with slideshow of photos. When it comes to arrange files and folders on iPad, people who came from Mac and windows faces problem. They generally have problems in managing files on iPad due to unusual behavior. However, there are several apps are available on iTunes store which can help users in managing files and folders on iPad. Appsicum team also developed an app “Files-Finder Edition” which helps to manage and organize documents on iPad easily. It supports several extensions of files such as Doc, Docx, RTF, TXT, PNG, JPEG, PDF and Zip. It provides option to edit documents like excel and word via Google drive. 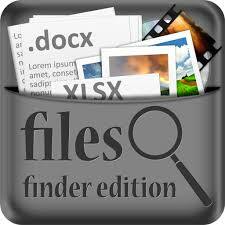 Here are some other features of files-finder edition which user can find more useful while they are using iPad for official purpose or just want to open PDF files. • It has good older like interface with gesture control and touch screen optimization. • Built-in-file previewer for most of the file types. • Easy to sync files on cloud networks such as Google drive, dropbox and Sugar Sync. • User can create custom shortcuts for files which they use frequently. • From security concern, user can lock their important files and folders. • User can sort files based on different parameters such as tags, file size, file types and date. • Items can be categorized easily such as Microsoft Outlook. • User can share files via email, facebook, twitter and many more. Why to Choose Files-Finder Edition Over Other E-Book Reader App? If someone requires e-book app, then definitely they will search in apple store or play store and will find some references of apps which they can download for their mobile devices. However, it doesn’t make any sense if you download any app for only one function as it would be great to find another app comprising desired features plus extra features so that you will get benefit from app. In this way, you will do more than one work from your mobile device. If you need any e-book app or PDF reader app which lets you read PDF files on your iPad, then you will search for “E-book app for iPad”. Like, you will find reference for some apps which you can download to your iPad. However, you can take smart decision by choosing an app that will allow you to open and edit PDF files along with excel, word, PNG and TXT files. In this way, you will be able to perform multifunction on device with the help of app. • Supports almost all file types such as Doc, Docx, RTF, TXT, PNG, JPEG, MP4 and many more. • Built-in file previewer for most of the file types. • Sync files on cloud network such as Google drive, Dropbox and Sugarsync. • Edit documents like excel, word with the use of Google drive. • Lock important files and folders for security purpose. • In-built browser with pre-loaded bookmarks and file downloaded manager. • Sort and search files based on type, size, date and category. What you should look in to scheduling app? These days several apps are available in market which promises you to schedule your work along with several facilities. However, sometimes app crashes after purchasing apps from app store or Google play store. To overcome all these problems, you must read reviews of app before purchasing it from store. Whenever you need scheduling app, then you must search for it in brief. You can compare different apps and features that will help you to explain features of app exactly. If you are looking for scheduling app, then future scheduler app might best for you as it comprises several features that you couldn’t found another where. This app not only schedule call for future date or time, even helps you to schedule message, social media post and emails. Therefore, whenever you are in a meeting and want to send an important message to your friends or wife, then you can pre schedule it with Future Scheduler app. This app will send message automatically to recipients. Features of this app are very useful which attract you to use this app. You can schedule recurring events such as once, daily, monthly and yearly. In short, this app works as personal secretary for you that schedule your daily work. Future scheduler is available for iPhone, Android phone and BlackBerry world and you can find easily in play store. While having all the talk in business days, often we forget to wish our friends on their important events like on their birthdays, marriage anniversaries or any other events and why friends we keep engage ourselves in job or business so much that we could not wish our family members. Though, it’s understandable that you are working for your family but what if you are not able to give them time on their important occasions also and if you are too busy on your workplace, you can even send a greeting text message or you can call them, but generally people forget to do that also. Future scheduler is such an app that lets you schedule not only your message but also schedules your calls, emails, and even social media updates also. You can schedule your emails in case if you often forget to send important business emails to your clients. You can schedule you calls if you forget to call someone. Suppose you forget to call your wife informing her that you will be late coming to home as you have business meeting with client after business hours. Now you can schedule a text or a call whichever is convenient for you at the time and can inform your wife quite easily. What future scheduler will do after scheduling a text message, a call or an email, it will ask you for confirmation and that will only happen if you have checked “Ask before Sending” while scheduling, call, texts and email and based on your confirmation message will be automatically sent from your phone, call will be automatically connected and email will be automatically sent from your email id. You don’t need to bother about the rest of things as future scheduler will take care of that. You just need to schedule the things if you feel you will forget to do that on a particular time. Future scheduler also works as a Reminder app for you as it brings a pop up on your home screen and reminds about the things which you have scheduled. This pop-up will be for confirming before automatically send and through this you are knowing what you have forgotten perhaps so this works as an all in one scheduler on primary while works as a reminder/alert app on secondary part. Your friends will most like this app when you will be telling them that how you wished them on their birthdays in midnight exact at 12.00 am while sleeping all night. Why Future Scheduler is Perfect Option for Reminder App for iPhone? Everyone is busy in their daily life and routine work and due to busy life we usually forgot our important works. Some of us use traditional methods and write important dates in diary and notebook so we can remember those memorable days. While some people use smart phone and use reminder apps that they can use to make a call to their loved ones. For example, if someone wants to wish birthday to his wife or husband and due to buys life they forget about it, so instead of missing this special day they can use an app that can remind them about birthday event and automatically connect message or call. Future Scheduler is exact solution for forgetting problems. This app is available for iPhone, Android and Blackberry and users can use this app to schedule call, message, Email and social media post. Future scheduler is reminder app that solves problem of forgetting and offers you a solution to organize your all events. Once you schedule call, message or email event, this app will remind you about your event and can send message and email automatically. Here are features of this app that you will find very useful for your iPhone and Android phone. It can syncs with device calendar easily. This app has snooze function for reminders and alerts. You can import contacts from facebook and social media accounts. You can see log of scheduled activities. This app has several templates which you can use for text and email. You can recur events – once, daily, weekly, monthly, or yearly. App has intuitive and user friendly interface. This app has option of selecting multiple recipients for text and email. This app can integrate with phone book to let you add recipients conveniently. This app sever multi functionality for smart phone users where user can schedule Call, message, email and social media post for future date and time. If you are away from your desk and you want to send any email to your client, boss and team then you can schedule email and Future Scheduler will send email automatically to selected recipients. Like thus future scheduler work as personal secretary for you which helps you to schedule your tasks from your iPhone, android phone and Blackberry phone. You can download future scheduler from iTunes store. iPad is such a device who brings the office work on your home desk for many of us as often we found our iPad quite handy to accomplish official tasks like sending emails, viewing presentations, preparing and viewing client reports. With a comprehensive approach to security, scalable deployment and variety of management options has made it the popular choice for users in most of the business environments. But, still what make users feel hectic often are managing documents on wider scale on ipad. No matter if you are using iPad on your home or on your business, if you have thousands of files stored on your iPad, it will be like you are stuck whenever you have to find a particular file or have to sort them or have to search few out of the bundle. Most people find difficulties even in reading pdf files through iOs default file opener. Though, there are some apps like Readdle’s Documents 5 and File Manager Pro app etc but none of these has vast functionality as Files-Finder Edition is having. Let’s take a look what are the prime features and specifications this wonderful file manager productivity app for iPad is having. Good Old Finder like Interface: App’s interface has been designed in such a way that both Mac and Window users find it convenient and familiar with them. To Windows users interface will look like “explorer” while for Mac users it will look like “Old Finder like interface”. Vast Variety of file formats supported by App: There are many app which supports basic file formats on iPad but this is the first one in which a wide file format support has been provided to users so that users can stick with this as the only file manager app for their ipad. There has been a built-in File previewer also through which you can know what data your files and folders contain. To name a few formats there are Doc, Docx, RTF, TXT, PNG, JPEG, MP4, MOV, PDF, Web Pages, WAV, 3GP, Zip formats and many more which are supported by this app. Sync on Cloud: Various Cloud networks are supported on which users can sync their ipad files and can take back-up of their data. Cloud networks such as GoogleDrive, Sugarsync and Dropbox are currently supported. In future other networks like box, office 360, etc are to be included also within App. Also, you can edit your excel and other files using GoogleDrive right within Files-Finder Edition. Managing Files on iPad Easily: You can create custom shortcuts for frequently used files, create filters, search files sort them based on multiple sorting parameters like date, file name, type, tags, size, categories etc. you can lock your important documents if you want some privacy. In-Built Browser with Download Manager: There has been a download manager which supports background downloads also with an in-built browser that gives you the power of internet on your ipad and connects you with rest of the world. Browser’s search function has been integrated with twitter, Wikipedia and Google so that you can directly search on these sites. Transfer Files via Secured Wifi, built in Zip creation and extraction, gesture based copy/move/paste, and File sharing via email, Facebook, twitter, etc, creating voice notes and Air Print Support to take prints of your documents over Wifi are some other features which make this app real worth for iPad users wanting complete control on their data.